There will be a bus change that will happen at Old Mill Elementary for the Lake Point area starting Monday, April 9th. Due to overcrowding on some of the busses in the Lake Point area, the Transportation Department has implemented a change. The bus stop at 7253 Ridge Road pick up and drop off time will remain the same, but the bus will change from Bus 3 to Bus 13. 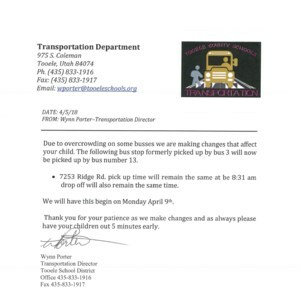 If there are any questions please contact the Transportation Department at 435-833-1916.